Stem: trailing to ascending, +- woody, +- gray in age, scabrous or +- glandular-hairy towards tips; stems with inflorescences generally unbranched above. Leaf: blade 1--4.5 cm, ovate, puberulent or glandular-hairy (hairs of youngest leaves with conic base). Inflorescence: involucre bell-shaped, 5--8 mm. Flower: perianth 5--14 mm, broadly funnel-shaped, pink to purple-red (white). Fruit: +- 5 mm, ovoid, generally lightly dotted or wrinkled (smooth), glabrous. Synonyms: Mirabilis californica A. Gray; Mirabilis californica var. californica; Mirabilis californica var. cedrosensis (Standl.) J.F. Macbr. ; Mirabilis californica var. cordifolia (Dunkle) Dunkle, illeg.? 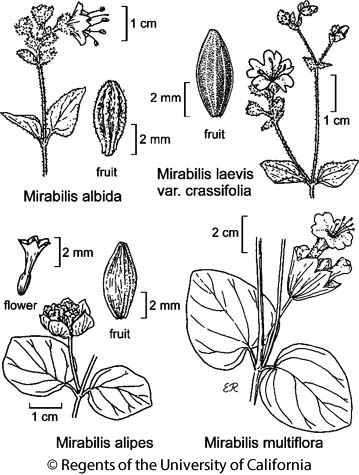 Citation for this treatment: Andy Murdock 2012, Mirabilis laevis var. crassifolia, in Jepson Flora Project (eds.) Jepson eFlora, http://ucjeps.berkeley.edu/eflora/eflora_display.php?tid=80351, accessed on April 19, 2019.
c&s SNF, Teh, CCo, SCoR, SW, W&I, w edge D; Markers link to CCH specimen records. Yellow markers indicate records that may provide evidence for eFlora range revision or may have georeferencing or identification issues. Purple markers indicate specimens collected from a garden, greenhouse, or other non-wild location.